Since July I have had an ongoing commitment to myself to read each month at least five books across a variety of genres and topics. So far, so good. Although I have always been an eager and voracious reader, I realized over a period of years that the life of my mind was in danger of stagnation and that I owed it to myself not only to exercise my body but also to exercise my reader’s mind. I am now fifteen books in, which is more than I read personally all of last year (not counting, of course, the extensive chapter book reading I do with my oldest, age six, or the quick articles and such I read daily). Five books a month is not near what I used to do at my peak, but it is a start. It takes effort to fit in, I find. I have to be intentional about my reading time, just as I do with my running and swimming time. I find that requirement of intentionality makes me appreciate these words and books all the more. A theme in my life seems to be that anything is sweeter when we have to work for it. For this month’s reading, I happened to choose a timely theme: timely because I am in the middle of training for a half marathon race that is quite important to me. I am headed in a couple of weeks to lay down a year’s worth of work at Long Beach. I’m nervous, excited, encouraged, focused, hopeful, and scared. I decided to use this month’s reading time to help hone my mental preparations for this significant moment in my personal narrative. My mom and my Aunt Donna were deep in conversation about this one during Labor Day, and I began reading this true story that very night. Unbroken is the story of Louie Zamperini, a delinquent youth who became one of the greatest runners the country had ever seen, who then competed in the 1936 Olympics in Berlin. Although training for the 1940 Olympics, he became a bombardier when we entered the war. Zamperini then lived through a tale of war almost too horrific to be fathom: after five weeks stranded on a raft in the middle of the Pacific Ocean after his plane goes down, he is picked up by a Japanese military boat and detained as a POW. For two-and-a-half years. How he endures the pain of starvation and dehydration adrift on a raft for weeks, and then how he endures absolutely brutal and inhumane treatment in the cruelest of Japanese internment camps is utterly breath-taking. His courage and tenacity—his fight to live and to retain his dignity amidst degradation—had me in tears. This is a story of forgiveness, too, and inspiring is the verve with which Louie decided to live his life after he made peace with his past. I found myself learning quite a bit I didn’t yet know about WWII, as well. This book is one of my favorites so far. Well worth a read. How do we deal with pain beyond human imagination? From where inside of us comes the will to survive? I’m not sure this treasure from the 1970s is attainable anymore, but Bill unearthed this collection of essays from his office library for my enjoyment a few months ago. There are a couple hundred essays in here, reprinted from Runner’s World issues published from the 1960s up to 1971, from a variety of authors. The essays are sorted into “The Basics,” “Races and Racing,” “Coaching and Training,” “The Reasons Why,” “The People,” “Running Views,” and then there are appendices of World and American running records (at the time in ’71), metric conversion tables, major running periodical lists, and so on. In the early mornings after my runs and swims, I would cuddle up with warm tea in my favorite chair and pick off a few of these essays at a time after kissing Bill goodbye at his car and before Katie and Eric woke up and we got going for the day. I particularly connected with the essays by Kenny Moore, an Olympic marathoner, writer, and U of O athlete under Bowerman. Although the essays were male-centric (female racing wasn’t at all as prevalent in the era these were written), I find that the reasons for running are more human than gendered. Knowing the history of my sport, I think, is one of the ways to honor it. So many of these essays became thought-life during runs this month. How do I make myself better? What does it take? 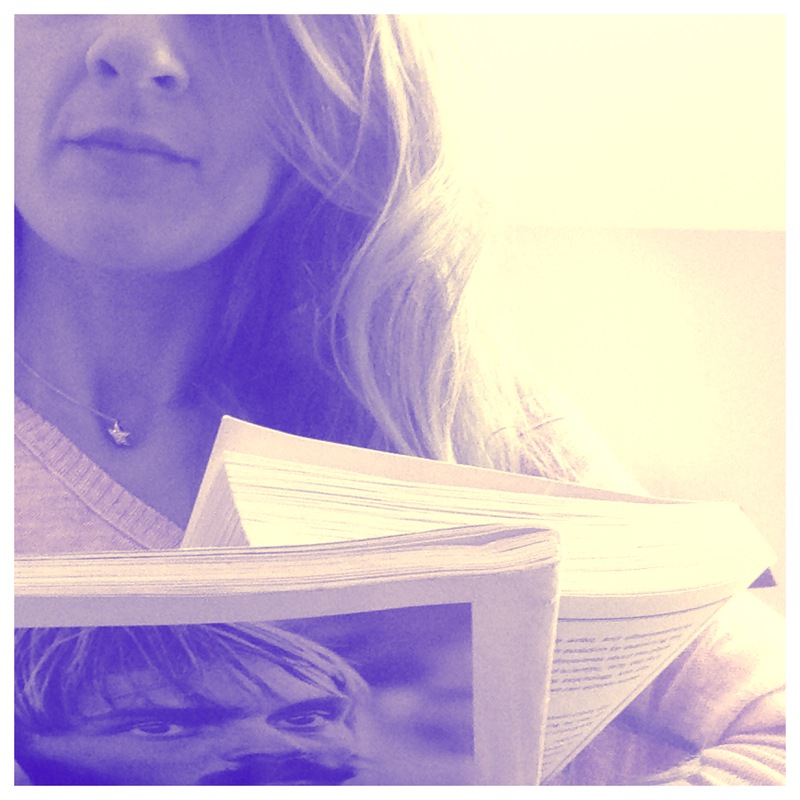 Legends never really die, and it is a testament to Steve Prefontaine that a generation after his untimely death, there is a young woman in her 30s and a mother of two who still feels the pull of his presence from when he was here running around this earth. I am not the only one to recognize something humanly elemental in him, something so gutsy and so compelling. I suppose there must have been something in the way he ran and left it all there on the track that touched on the very act of human evolution and survival itself. Perhaps it was like watching our species fight its way through eons of muck and adaptation to achieve this form. Long ago before I ever stepped foot in a running shoe, Bill used to tell me about Pre. I never fully understood. What does it mean to give it all? What does it mean to go for the run of your life, several times over, with the purest guts most people have ever seen? Now that I run, I get it. What does it mean to be out the door in the early morning hours nearly every day, chasing down that elusive best self? Perhaps it was running Pre’s trail this summer in Eugene, or perhaps it was the act of seeing his rock on the night I ran Butte to Butte, or perhaps it was remembering him as we drove through Coos Bay on the way home, but I got done with this little biography and cried into my tea. Whatever Pre represented—whatever it was that was in him—well, to have it gone from this earth… that’s a reason to weep. He was scrappy, hard working, focused, and absolutely willing to get the pain and stare at it straight on without backing down. That’s pretty darn rare, I think. When I am in the clutch on a training run or interval or in a race, I think about Pre quite a bit. WWPD? What would Pre do? I keep his guts in mind. My friend Steve couldn’t have known it, but when he brought this book to me as a gift for having him stay two nights this month for Spartan racing and training, this nonfiction book fit perfectly into my thematic month. I swapped out something else I was going to start and plunged right into this one. Heinrich is an ultrarunner, who came in first in the 100K in Chicago in 1981. This is a beautiful book, a paean to running and to our evolution as a human species. The author is also a naturalist and a scientist—he mainly studies insects and birds—who has been running since childhood. Not only an ode to running, this book also seems to be a lyrical and scientific reflection on humanity itself. What is the primal drive to win? What adaptations do other animals have that we could try to mimic in ourselves? Part memoir, part training guide, part natural history, and part science text, this seems to be a book that every avid runner would not want to miss. Heinrich’s enthusiasm for the art of running inspired me, and more than once I have tried to imagine the staggering resplendence of the antelope he describes turning its legs over more precisely that any machine or other animal ever could. I imagine the birds flying for hours and days with no fuel, migrating and elegantly adapted over millions of years to have a digestive and respiratory system to allow them to do so. I think of the way bees keep cool. I think of the forests through which he trains. Heinrich’s writing pours easily into the brain and feels soothing after a hard run—this was another book I would read in the mornings before my kiddos got up, after my training session. He conveys perfectly a deep appreciation for our sport. The book title says, “the science of running,” and that’s a promise. The first part of this book is heavy, heavy on the scientific whys and hows of running, which has entertained me in my running thought-life to no end. I now spend time picturing my muscle fibers and thinking about topics like violating homeostasis, oxygen transportation, buffering high acidosis, biomechanical efficiency, and glycolysis and how long specifically it takes to reach maximum capacity, etc etc. Here is one small sample of text from near the start of the book: “At rest, the myosin heads cannot attach to the actin because the attachment site is blocked. However, the calcium released frees up the attachment site and allows the myosin head to attach to the actin…” I love it. I think it honors the sport to know the real science behind how the body performs. The second half of the book is a training manual of sorts, as he gives advice to coaches about how to set up workouts and cross training. Magness knows his history, keeps current, is definitely science minded and questions tradition when it needs to be questioned. This was, perhaps, a bit of a drier read, but I needed it. I read this concurrent to Why We Run, and they balanced each other perfectly. There are ideas and lines from this book that I now repeat to myself and did use to great effect this past week during a gnarly set of intervals. By delving into the science, I have begun to see where and how I can push my body a bit more. I still leave the coaching to Bill, but this book confirms that our plan to start plyometrics after my racing season ends with Long Beach and before the spring season is probably the best idea. Choosing running-themed reads this month has been helpful during these past weeks of intense training. I’ve had some longer runs and some insane intervals, and the words and ideas in these texts have buoyed me along and reminded me, at heart, of why I do what I do. I am growing ever fascinated with the role of the mind in staving off pain, and I am increasingly motivated to keep challenging and pushing myself. How far can I go? What does it take to conquer myself? How do we handle fatigue? If we dig down as deep as we can go, what will we find in ourselves? How do we become our best? What is the purpose of working as hard as we can? What does it mean to be alive? What is the essence of our dignity? I need to choose now a new set of books for this next month. I skew heavily toward nonfiction, it seems, and all of my personal reads this month were in that genre. I do take in quite a bit of fiction with Katie and Eric, and I have an extensive history with it, but perhaps I ought to make it a point not to lose that genre completely in my personal reading. On the other hand, I might decide to head toward an “education/pedagogy” theme this month. Or maybe I will just be eclectic again. I am always looking for recommendations. Four of these books were recommendations (the 5th I happened to find in our digital library—Bill had been reading up on coaching), and all of them were huge hits for me. So thank you, Mom, Aunt Donna, Bill, and Steve. You made my month with these!